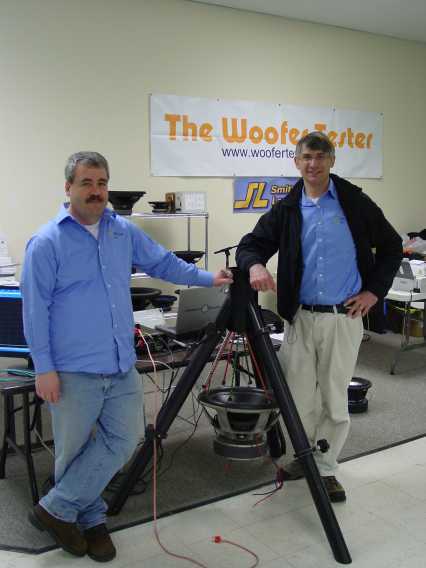 We had a great time at a db Drag event in Niagara Falls http://www.termpro.com/asp/members2.asp?Who=13&MemberID=9892&Page=1 this last weekend, where we showcased the Woofer Tester Pro and gained a new perspective on bass. Participants at these events compete in different categories of SPL. 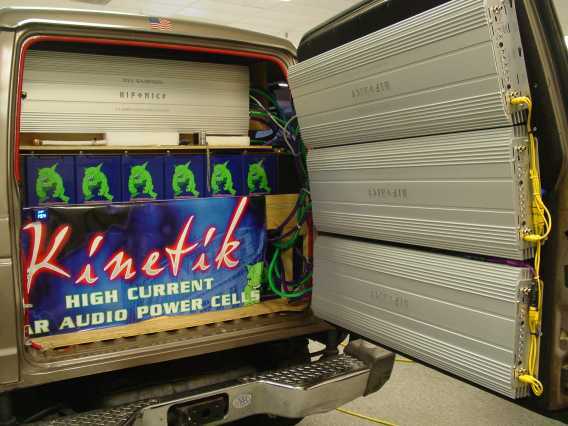 A wide range of cars, trucks and vans were entered using everything from simple closed box designs to large multi-driver folded horns in the extreme case. Now, while we have certainly heard bass, and have on occasion felt bass (IMO feeling a 15 hz pipe organ is kind of cool), we had never SEEN bass. The highest level achieved was a stunning 168.2 db 'burp' with 20 kW of power applied! Thankfully nobody was inside because this had the windows, doors and body panels visibly flexing in an eerie rippling effect, not to mention the wiper blades dancing several inches off the glass ! Several drivers were destroyed this time, sparing the windshield (replacements for both were on hand). It is kind of weird to see the glass flex. That's what we mean by 'seeing' bass. Compared to the room in a house, the standing wave modes of a car are a lot more complicated than a simple function of cabin dimensions might predict. Not only is box placement critical, but total cabin volume has an effect. Knowing the maximum response between the excitation point (speaker box) and the sensing point (the windshield) could then be used to design a high efficiency box for that frequency. That is, until the extreme cases physically distort the vehicle! 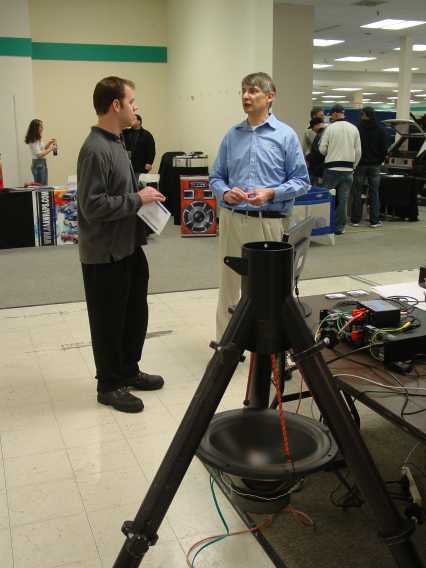 A big thanks to Tim Roy from Sound Xtreme as well as Bill Lolo, Erie Maxson and the gang from http://www.psychoacoustics.name for welcoming us to this event. this is a bad audio recording sorry a 400$ camera with video ability's just don't cut a 161 db average over 30 seconds or a "bass race" like we call it with music and not test tones, they guy that was along for the ride said he couldn't see ,breathe or hold his stomach in it felt like it was going to come out his mouth, he said and after that experience he had pain in his ribs like he got punched over and over again the next day !! 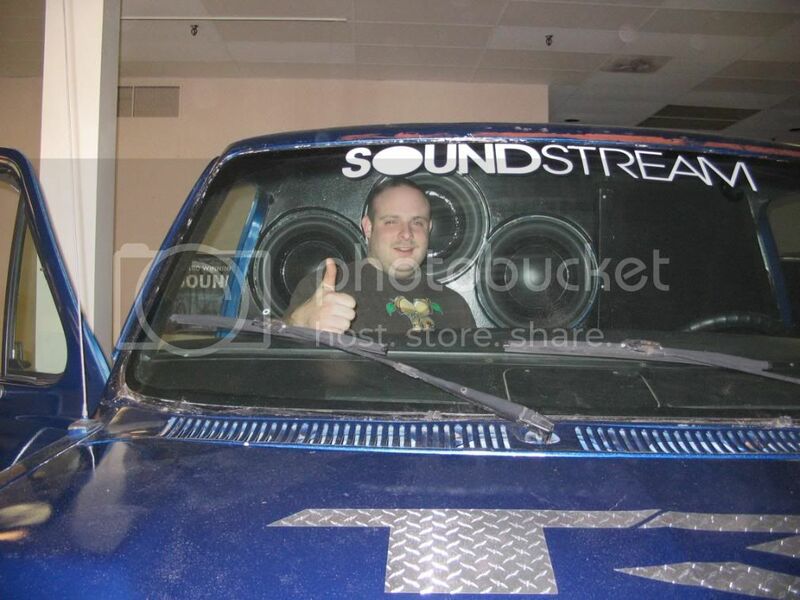 definitely a brave man that took a beating form 9 15" T3 audio woofers and 2 soundstream 10kwatt amps per sub!